Дополнительная информация: Basin-mounted soap dispenser has polyethylene soap containers with easy viewing of soap level. Units have stainless steel soap containers with 21-fl oz. (0.62-L) capacity. Unit requires a 1" (25mm) hole in the vanity or basin. 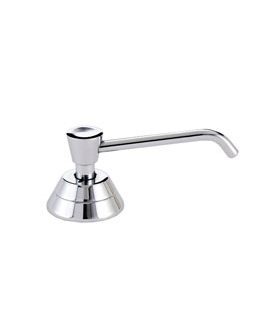 4" (102mm) long spout directs soap flow over sink. Exposed portions are chrome-plated brass. Capacity: 7" (177mm) - 21-fl oz. (0.62-L) capacity.